Mod Emerald Sofa. // Yellow Typewriter. // Yellow Pendant Light. // Orange Caged Pendant Light. // Typography Globe. // Moby Stapler. // Mod Office Chair. // iPad Printer. // Faux Fur Rug. // Chanel No 5 Pillow. // Orange Pillow. // Jane Austen Print. // Tokyo Print // Wall Calendar // Day of the Week Pencils. // Mixtape Dispenser. My husband and I have been talking about renovating my office in the near future so I've been spending some of my free time making mood boards. We are going to be building a desk and shelving onto the walls and adding tons of comfortable seating and fun colors. I have a really awesome vintage Tab filing cabinet that is over seven feet tall and I'm using it as inspiration because it's such a big statement piece. The cabinet is yellow, orange, and mustard and I love it. I wish I could find another like it but I haven't seen one anywhere. 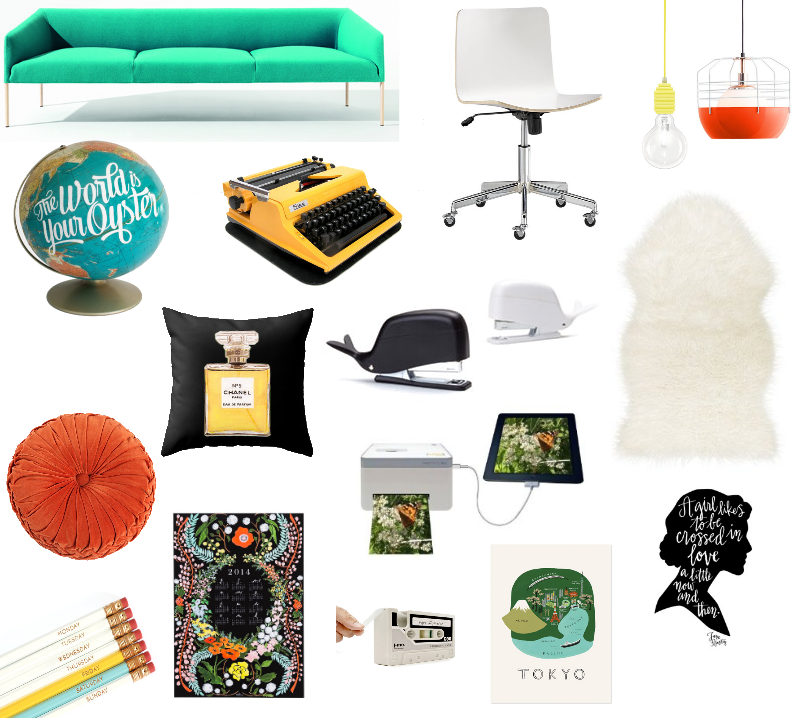 I love the color combinations in this mood board and the fun modern elements that still have a bit of a vintage twist. I want to keep the space really bright so I'm planing on white walls and plenty of lighting. I want to add a few little novelty items to make the room feel more fun. I'll probably change my mind about a million times before anything is final but I'm loving the idea of creating a new fresh space. How do you get inspired when re decorating a space in your home?